This great rock temple in ancient Egypt, built by Ramses II Pharaoh, is the largest in Nubia and one of the most impressive and famous memorials of ancient Egypt. It is carved out of living rock and at the entrance four seated colossi of Ramses II, each 66 feet high, together with smaller statues of members of the royal family, form the entrance. 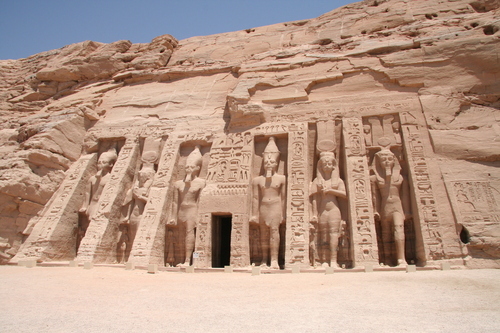 Ramses II is one of the central figures in Egyptian history. Although responsible for but one great battle and one great peace alliance, he raised so many inspiring monuments to the glory of his ancestors (some of which were indisputably better rulers and conquerors) and had himself portrayed in such huge statues, that he has gone down in history as one of the greatest of Egyptian pharaohs. The temple of Abu Simbel (at its new site above the waters of Lake Nasser) is so oriented that the rising sun casts its first rays through the entrance, down a double row of statues of Ramses Pharaoh in Osirian form clasping crook and flail, and through to the sanctuary where he sits in the company of the gods Ra, Ptah and Amon. In following the Nile upstream we have briefly outlined the chief monuments in the Nile valley; the material relics of the ancient Egyptian civilization. In the rural areas of Egypt, however, we see the peasant farmers with sturdy-bodies and almond- shaped eyes strangely reminiscent of the murals of the tombs of Saqqara that we have described. They still plough the fields with oxen, harvest the crop with sickle and use a winnowing fork to sift the grain. Their villages are largely of sun-dried brick. The buffalo and donkey are still their faithful companions. Geese swim in the ponds and canals where migratory birds settle for a short time before taking once again to the air. Fishermen cast their drag-nets, trawl-nets or wicker baskets. The dykes between fields serve as paths. And the plant forms that influenced ancient Egyptian architecture, the papyrus ,old records, lotus and reed, can still be seen growing in abundance. Largely barren Upper Egypt still has economic ties with the south, while the fertile, cosmopolitan Delta looks to the countries of the Mediterranean.